Could you tell us more about the EEFV VCA solution you choose? How does it compare to Seppomans Solution? 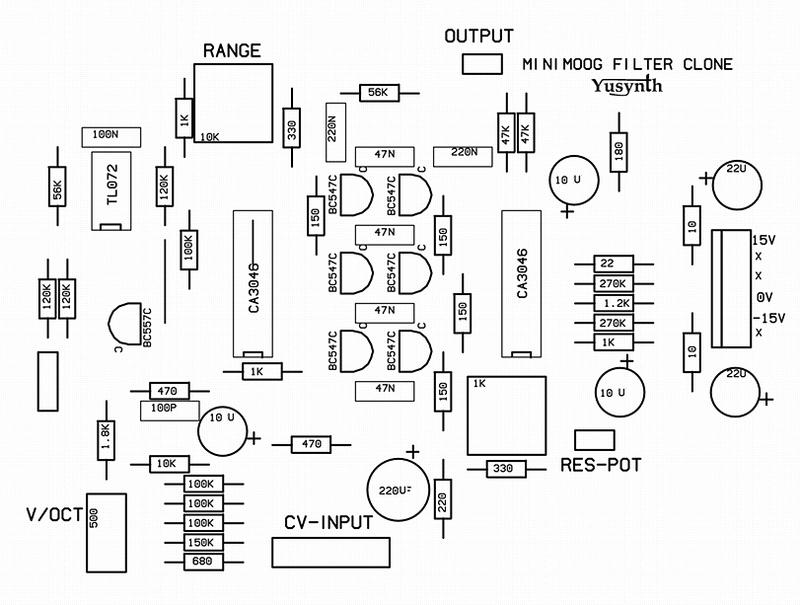 I see that Yves (YUSynth) uses a transistor array for his take on the famous VCF instead of manually matching discrete transistors the way that RenÃ© Schmitz and later JÃ¶rgen Bergfors of Bergfotron fame did it. That would save work! After thinking about it over some sleep I decided to keep it as simple as possible: Either use SSM2044 or some other IC I have, or a very simple array-based filter as this will be polyphonic. Also it takes 4xAOUT_NG (expensive, innit?) for control. Add a bipolar PSU and maybe VCAs. Either I will use Seppos VCAs (as I already planned ahead and got some PCBs) or I'll use what's already in the CEM chips if I go that route. Or I can attempt a 1-transistor VCA the way Korg did it in the PS-series of synths, but that's less than optimal for sound and control. Good for the low parts count though. Maybe Stophlex has made some progress as I know that he was also looking at an external VCF/VCA box? However, the JB Weld has cured enough. Time to do the encoders and LEDs! I got a source for CEM Chips in Germany, but I need to find the link if you want it? BUT, it will take a while before I get to that stage. sound! So keep up man! You are absolutly Welcome!